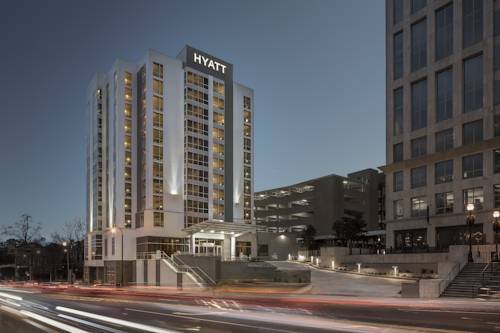 Hyatt Atlanta Midtown is a new, boutique business hotel centrally located in Midtown, Atlantas 2nd largest business district. Hyatt is a 4 Diamond, full service property specializing in unique, personal experiences making business travelers feel welcomed, comfortable and efficient. Location is ideal as the hotel is next to public transportation, over 100 restaurants and bars, and Atlantas largest green space, Piedmont Park. Hyatts 12 floors are elegantly adorned with modern dcor, featuring 194 stylish guestrooms, well- appointed with floor-to-ceiling windows and oversized workspaces. Some also offer expansive views of Piedmont Park, Downtown Atlanta, and Buckhead. To unwind, travelers will love our heated indoor saltwater pool and 24-hour Fitness Center. For a drink or a bite, Fork & Juniper and Juniper Bar offer New Southern cuisine and cocktails on-site in a stylish, street-side setting. The Hyatt Midtown Atlanta is in the heart of the Midtown district with the city in reach. Neighbors with the Margaret Mitchell House and Museum and the High Museum of Art, Hyatt Midtown is minutes from picturesque Piedmont Park and is blocks away from specialty shopping. Bar Juniper offers guests & locals a stylish place to unwind. Bartenders create custom cocktails and a relaxing ambiance.